Platonic archetypes begin to appear around an English country town, wreaking havoc and drawing to the surface the spiritual strengths and flaws of individual characters. From the top of the bank, behind a sparse hedge of thorn, the lioness stared at theHertfordshire road. She moved her head from side to side, then suddenly she became rigid as if she had scented prey or enemy; she crouched lower, her body trembling, her tail swishing, but she made no sound. Almost a mile away Quentin Sabot jumped from thegate on which he had been sitting and looked at his wrist-watch. “I don’t see much sign of this bus of yours,” he said, glancing along the road. “And arrows showing the directions he wanted to go?” Quentin asked idly. “They may be hanging the lanterns on poles,” Quentin protested. “The devil there is!” Quentin exclaimed, while Anthony, more polite, said, “I see — yes. That does seem a case for warning people. But we’ve been resting down there and I suppose your man made straight for the cross-roads and missed us.” He waited to hear more. “O keep quiet,” the first man snapped back, and during the half-suppressed wrangle the two friends parted from the group, and stepped out, with more speed and more excitement than before, down the road in front of them. “To me or to the other fellow?” Quentin asked. But his friend had already seen. A long low body had slithered down the right-hand bank some couple of hundred yards away, had paused for a moment turning its head and switching its tail, and had then begun to come leaping in their direction. It might have been mere friendliness or even ignorance — the two young men did not wait to see; they were through the gate and up the short garden path in a moment. In the dark shelter of the porch they paused. Anthony’s hand touched the knocker and stayed. At that moment a shout not very far away broke the silence, and at once the garden was disturbed by violent movement. The lioness as if startled made one leap over the gate, and her flying form seemed to collide with the man just as he also began to take another rhythmical step. Forms and shadows twisted and mingled for two or three seconds in the middle of the garden, a tearing human cry began and ceased as if choked into silence, a snarl broke out and died swiftly into similar stillness, and as if in answer to both sounds there came the roar of a lion — not very loud, but as if subdued by distance rather than by mildness. With that roar the shadows settled, the garden became clear. Anthony and Quentin saw before them the form of a man lying on the ground, and standing over him the shape of a full-grown and tremendous lion, its head flung back, its mouth open, its body quivering. It ceased to roar, and gathered itself back into itself. It was a lion such as the young men had never seen in any zoo or menagerie; it was gigantic and seemed to their dazed senses tobe growing larger every moment. Of their presence it appeared unconscious; awful and solitary it stood, and did not at first so much as turn its head. Then, majestically, it moved; it took up the slow forward pacing in the direction which the man had beenfollowing; it passed onward, and while they still stared it entered into the dark shadow of the trees and was hidden from sight. 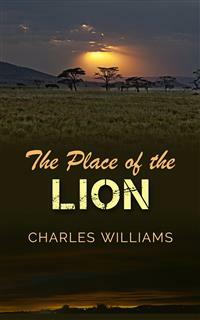 The man’s form still lay prostrate; of the lioness there was no sign. Minutes seemed to pass; at last Anthony looked round at Quentin. “We’d better have a look at him, hadn’t we?” he whispered. Hedashed out to the fallen man, dropped on a knee by him, still glancing quickly round, bent over the body, peered at it, caught it, and rising tried to move it. But in a moment he desisted and ran back to his friend. “No,” Quentin said, still shooting glances over the garden. His cry, however, was answered reassuringly. For the sound that had startled him was this time only the call of a human voice not far off, and it was answered by another still nearer. It seemed the searchers for the lioness were drawing closer. Lights, many lights, were moving across the field opposite; calls were heard on the road. Anthony turned hastily to Quentin, but before he could speak, a man had stopped at the gate and exclaimed. Anthony ran down the garden, and met him as, others gathering behind him, hecame through the gate. He was the man with whom the friends had talked before. He went straight to the prostrate man, bent over him, felt his heart and touched him here and there; then he lookedup in perplexity. “Right ho!” the other answered. “I’d better slip in and warn his housekeeper, if she’s about. One or two of us will give you gentlemen a hand.” He waved to the small group by the gate, and they came in, to have explained what was needed. Then their leader went quickly round the house while Anthony, Quentin, and the rest began to lift the unconscious Mr. Berringer. It was more difficult to do so than they had expected. To begin with, they seemed unable to get the proper purchase. His body was not so much heavy as immovable — and yet not rigid. It yielded to them gently, but however they tried to slip their arms underneath they could not at first manage to lift it. Quentin and Anthony had a similar difficulty with the legs; and indeed Anthony was so startled at the resistance where he had expected a light passivity that he almost fell forward. Atlast, however, their combined efforts did raise him. Once lifted, he could be carried easily enough along the front of the house, but when they tried to turn the corner they found an unplaceable difficulty in doing so. It wasn’t weight; it wasn’t wind; itwasn’t darkness; it was just that when they had all moved they seemed to be where they were before. Anthony, being in front, realised that something had gone wrong, and without being clear whether he were speaking to the body or the bearers, to himself orhis friend, said sharply and commandingly: “O comeon!” The general effort that succeeded took them round, and so at last they reached the back door, where the leader and a disturbed old woman whom Anthony assumed to be the housekeeper were waiting. “Upstairs,” she said, “to his own bedroom. Look, I’ll show you. Dear, dear. O do be careful”— and so on till at last Berringer was laid on his bed, and, still under the directions of the housekeeper, undressed and got into it. “No, no,” Anthony said hastily. “I wasn’t joking. Only —” He gave it up; it would have sounded too silly. After all, if they were looking for a lioness and found a lion . . . well, if they were looking for the lionessproperly, it presumably wouldn’t make much difference. Besides, anyhow, it couldn’t have been a lion. Not unless there were two menageries and two —“O God, what a day!” Anthony sighed; and turned to Quentin. Damaris Tighe had had a bad night. The thunder had kept her awake, and she particularly needed sleep just now, in order to be quite fresh every day to cope with her thesis aboutPythagorean Influences on Abelard. There were moments when she almost wished she had not picked anyone quite so remote as Abelard; only all the later schoolmen had been done to death by other writers, whereas Abelard seemed — so far as theses on Pythagorean Influences went — to have been left to her to do to death. But this tracing of thought between the two humanistic thinkers was a business for which she needed a particularly clear head. She had so far a list of eighteen close identifications, twenty-three cases of probable traditional views, and eighty-five less distinct relationships. And then there had been that letter to theJournal of Classical Studieschallenging a word in a new translation of Aristotle. She had been a little nervous about sending it. After all, she was more concerned about her doctorate of philosophy, for which the thesis was meant, than for the accuracy of the translation of Aristotle, and it would be very annoying if she made enemies — not, of course, the translator — but . . . well, anyone. And on top of all that had come that crash of thunder, every now andthen echoing all through the black sky. No lightning, no rain, only — at long intervals, just whenever she was going off to sleep at last — thunder, and again thunder. She had been unable to work all the morning. It looked, now, as if her afternoon wouldbe equally wasted. “I hardly know him at all,” Damaris answered. “It doesn’t look as if he would, does it?” Damaris said, moving the sugar-tongs irritably. “If I would what?” Damaris exclaimed, startled and surprised. What, what could she possibly have to do with these absurd creatures and their fantastic religion? She knew, from the vague gossip of the town, from which she was not altogether detached, that Mr. Berringer, who lived in that solitary house on the London Road, and took no more part in the town’s activities than she did herself, was the leader of a sort of study circle or something of that kind; indeed, she remembered now that these same two ladies who had broken in on her quiet afternoon with Abelard had told her of it. But she never attended to their chatter with more than a twentieth of her mind, no more than she gave to her father’s wearisome accounts of his entomological rambles. Religions and butterflies were necessary hobbies, no doubt, for some people who knew nothing about scholarship, but they would not be of the smallest use to Damaris Tighe, and therefore, as far as possible, Damaris Tighe very naturally left them out of her life. Occasionally her father’s enthusiasm broke through her defences and compelled attention; it always seemed extraordinary to Damaris that he could not in her politeness realise her boredom. And now . . .
She paused, and Damaris supposed they were. “You could telegraph,” Damaris put in. “But where will you hold the meeting?” Damaris asked. She didn’t want to offend Mrs. Rockbotham who, though only a doctor’s wife, had influential relations, among whom was the owner of that literary weekly of which her cousin Anthony Durrant was a sub-editor or something of the sort. Damaris had had an occasional article, done for the public of course, printed there already, and she was anxious to keep the gate open. Indeed it occurred to her at once that if she could onlyfind among her various MSS. a suitable paper, she might use it both for that evening and forThe Two Camps, which was the name of the weekly. It had originally been meant to be symbolical of the paper’s effort to maintain tradition in art, politics and philosophy while allowing the expression of revolt; though Anthony insisted that it signified the division inthe contributors between those who liked it living and intelligent and those who preferred it dying and scholarly, represented by himself and Damaris. He had told her that in a moment’s exasperation, because she had insisted on talking of the paper instead of themselves. Anthony was always wanting to talk of themselves, which meant whether she loved him, and in what way, and how much, whereas Damaris, who disliked discussing other people’s personal affairs, preferred to talk of scholarship or abstract principles such as whether and how soonThe Two Campswould publish her essay onPlatonic Tradition at the Court of Charlemagne. Anthony had gone off in rather a bad temper finally, saying that she had no more notion of Plato than of Charlemagne, and that herreal subject wasDamaristic Tradition at the Court of Damaris; upon which he swore he would write a long highbrow article and publish it — Damaris being, for that purpose, a forgotten queen of Trebizond overthrown by the Saracen invasion. Mrs. Rockbotham was explaining that she had been talking to Mr. Berringer’s housekeeper on the telephone. The usual small arrangements had, of course, been made for the meeting, and the housekeeper, though a little reluctant, was under pressure compliant. Mr. Berringer was still lying quite quiet — unconscious, Dr. Rockbotham hadsaid. Mrs. Rockbotham and Miss Wilmot however both thought it more likely that the unconsciousness was of the nature of trance, Mr. Berringer’s soul or something having gone off into the spiritual world or somewhere, probably where time didn’t exist, and not realizing the inconvenient length of the period that was elapsing before its return. The whole thing sounded extremelydisagreeable to Damaris. The more she thought about it, the sillier it looked. But was it worth while, if Mrs. Rockbotham chose to be silly, refusing her request, and running the risk of a hostile word dropped in that influential relative’s ear? “But whatsort of thing do you want?” she asked slowly. Damaris, with the firm intention that Mrs. Rockbotham should have her hope fulfilled by assisting, if necessary, to print the paper in question, said good-bye, and herself took her visitors to the car. Then she went back to her study and set to work to find the lecture. When she did, it appeared even more technical than she had supposed. The main thesis of a correspondence between the development of the formative Ideas of Hellenic philosophy and the hierarchic angelicals of Christian mythology was clearly stated. But most of the quotations were in their original Greek or Latin, and Damaris was compelled to sit down and translate them at once, for fear of later hesitation about an adequate word, into bearable English. She took the opportunity to modify it here and there in case she hurt Mrs. Rockbotham’s feelings, changing for example “superstitious slavery” into “credulous piety” and “emotional opportunism” into “fervent zeal.” Not that Mrs. Rockbotham was likely to be worried by any insult to the schoolmen or Dionysius the Areopagite — she added a couple of sentences explaining “Areopagite”— but Damaris had only the remotest notion what these ladies supposed themselves to be doing, and even in pure scholarship it was never worth while taking risks unless you were pretty sure. The highly intellectualized readers ofThe Two Campswere almost certain to befree from any prejudice in favour of either the eidola or the angeli, but with Mr. Berringer’s disciples one couldn’t tell. She altered “priestly oppression” into “official influence” almost automatically, however, recalling that Anthony had told her thata certain number of clergymen took in the periodical, and after a couple of hours’ work felt fairly ready. It would, at worst, give her a chance of reading her paper, which she liked doing; things sounded different when they were read aloud. At best — well, at best, one never knew; someone useful might be there. Damaris put the MS. ready and went down to dinner. At dinner her father began talking. They sat opposite each other in the small dining-room into which two bookcases holding works on Proclus, Iamblichus, St. Anselm, and the Moorish culture in Spain had lately crept. The maid supplied them with food, and Damaris — to a less nourishing effect, but with a similar efficiency — supplied her father with conversation. He was more than usually thrilled today; never had he seen so many butterflies, and yet they had all escaped him. He sighed and went on eating. Damaris frowned. Damaris looked at him. He was short and rather plump, and he was enjoying the mutton. Beauty! She didn’t know that she hated him, and certainly she didn’t know that she only hated him because he was her father. Nor did she realize that it was only when she was talking to him that thedivine Plato’s remarks on beauty were used by her as if they meant anything more than entries in a card-index. She had of course heard of “defence mechanisms”, but not as if they were anything she could have or need or use. Nor had love and Heloise ever appeared to her as more than a side-incident of Abelard’s real career. In which her judgment may have been perfectly right, but her sensations were wildly and entirely wrong. “Plato says —” she began. “O Plato!” answered Mr. Tighe, taking, as if rhythmically, more vegetables. Damaris ignored this; her father on Plato was too silly. People needed a long intellectual training to understand Plato and the Good. He would probably think that the Good was the same thing as God — like a less educated monk of the Dark Ages. Personification (which was one of her side subjects) was a snare to the unadept mind. In a rare mood of benignity, due to her hopes for her paper, she began to talk about the improvement in the maid’s cooking. If time had to be wasted, it had better be wasted onneutral instead of irritating subjects, and she competently wasted it until it was time to get ready for the meeting. As she stepped into Mrs. Rockbotham’s car, she heard thethunder again — far away. She made conversation out of it. “Like Shakespeare, I suppose?” Mrs. Rockbotham asked, and for a moment took Damaris by surprise. “Hasn’t it?” Mrs. Rockbotham assented, and with such prolonged intellectual conversation they reached The Joinings, as Mr. Berringer’s house was called, with some vague and forgotten reference to the cross-roads near by. The thunder crashed again, as they got out, much nearer this time, and the two ladies hurried into the house. While Mrs. Rockbotham talked to the uncertainand uneasy housekeeper, Damaris looked at the assembled group. There were not very many members, and she did not much care for the look of any of them. Miss Wilmot was there, of course; most of therest were different improvisations either upon her ratheragitated futility or Mrs. Rockbotham’s masterful efficiency. Among the sixteen or seventeen women were four men — three of whom Damaris recognized, one as a Town Councillor and director of some engineering works, one as the assistant in the central bookshop of the town, the third as the nephew of one of the managing ladies, a Mrs. Jacquelin. Mrs. Jacquelin was almost county, the sister of a local Vicar lately dead; she called herself Mrs. Roche Jacquelin on the strength of a vague connexion with the Vendean family. “However does this Mr. Berringer interest them all at once?” Damaris thought. “What a curious collection! And I don’t suppose they any of them know anything.” A warm consciousness of her own acquaintance with Abelard and Pythagoras stirred in hermind, as she smiled at the Town Councillor and sat down. He came over to her. “Not so much Plato —” but there Mr. Foster was interrupted by Mrs. Rockbotham, who came up to Damaris.